Guy Orlando Rose was born March 3, 1867 in San Gabriel, California. He was the seventh child of California Senator Leonard John Rose who was a large southern California landholder and rancher (“Sunny Slope” Ranch). Today, the San Gabriel Valley town of Rosemead bears the family name. In 1876 young Guy Rose was accidentally shot in the chin while hunting with his brothers. During his recuperation he began to sketch and use watercolors and oil paints. After graduating from Los Angeles High School in 1884 he moved to San Francisco where he began his art training at the California School of Design under Virgil Williams and Danish-born artist Emil Carlsen. In the mid-1890s, Rose went to New York and taught at the Pratt Institute and did illustrations for Harper’s, Scribners, and Century magazines. In 1899 Guy Rose and his wife Ethel chose to return to France where they lived for twelve years, mostly in Giverny. In 1900 the couple resided in Paris and spent the winter in Briska, Algeria where Rose painted three known paintings. In 1904 Guy and Ethel Rose acquired an old stone cottage in Giverny where they lived until 1912. The cottage stood on part of the property known as the Sente des Grosses Eaux, located at the far west end of the village, a little over half a mile from the home of Claude Monet. 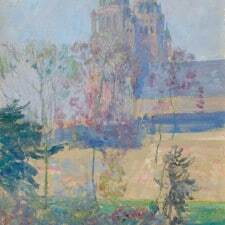 (Will South, Guy Rose American Impressionist, Oakland, California, 1995, p.37) Many young American Impressionists were living in Giverny at the time, including Frederick Frieseke, Richard E. Miller and Alson Clark, with whom Rose became very well acquainted. Rose’s work from this period show the influence of “the master” Claude Monet, who became his friend and mentor. While in Giverny, Guy Rose suffered from effects of recurring lead poisoning, thought to have been caused by the childhood gunshot incident. He had periods of time when he was unable to paint, thus creating fewer than 800 works in his lifetime. In 1912 Guy Rose returned to New York, where he worked and taught for two years. In 1914 he made his final move back to Pasadena, California where he taught and served as director at the Stickney School of Design. Soon after his return to the West, Rose won silver and gold medals at the 1915 Panama-Pacific International Exposition in San Francisco and the Panama-California International Exposition in San Diego. In 1921 he suffered a debilitating stroke that left him paralyzed. Guy Rose died in Pasadena, California on November 17, 1925. In 1926 the Stendahl Gallery held a memorial exhibition of his works. Guy Rose was a member of the California Art Club and Painters and Sculptors of Los Angeles. His work is in numerous collections including the Bowers Museum in Santa Ana; the Los Angeles County Museum of Art; The Irvine Museum; and the Crocker Museum in Sacramento.